10 January 2019 (Toronto, ON) - Abramorama announced today a partnership with MPL/Capitol/Ume/Universal Music Canada, the country’s leading music company, to premiere Paul McCartney’s The Bruce McMouse Show in select theatres around the world on January 21. The Bruce McMouse Show is a previously never-before seen film that tells the story of how Paul McCartney and Wings came to meet the inimitable impresario Bruce McMouse. Part concert film, part animated feature, The Bruce McMouse Show features footage from Wings’ 1972 European tour from Red Rose Speedway, interspersed with animated scenes that introduce a family of mice living under the stage. Watch a special teaser video HERE. After opening the film with “Big Barn Bed” – the camera takes us down through the floorboards into this charming animated world. We see Bruce McMouse regale his children with stories from his past, when son Soily rushes into the room in a whirlwind of excitement announcing that “The Wings” are playing above them. As the concert plays on, Bruce declares to his wife Yvonne that Paul and the band need his help. Bruce then proceeds to venture on stage to offers his services as producer. As the concert progresses, the animated scenes culminate with dozens of animated mice flocking to the venue to see Wings play. 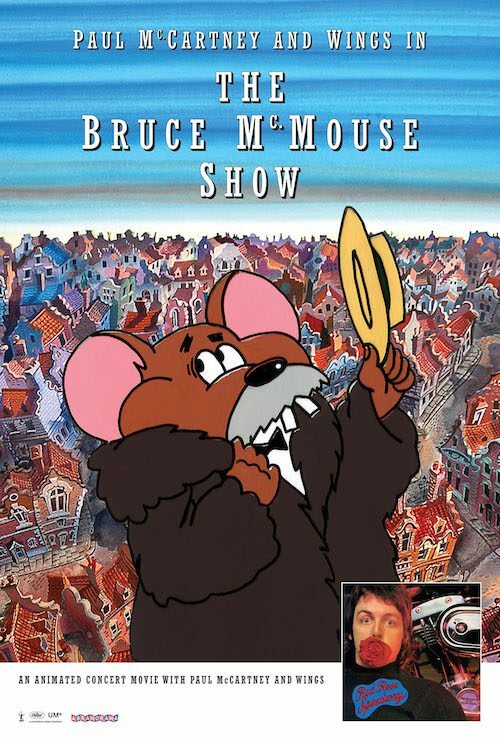 The Bruce McMouse Show has been fully restored in 2018 at Final Frame Post alongside a brand-new audio mix (stereo and 5.1) created at AIR Studios where it was also mastered. The film was directed by Barry Chattington and produced by Roger Cherrill with the live elements taken from four shows in The Netherlands and Germany in 1972. Paul viewed the initial concert edit and realized there was great potential in the material captured. Prior to the European tour, Paul had the idea of a family of mice and sketched the characters. Picking up the idea, Eric Wylam took Paul’s sketches and created the final McMouse family. This storyline was incorporated and used as a linking theme within the concert footage. The voice-overs for the animated mice took place at the end of 1973, recorded by Paul and Linda McCartney, Deryck Guyler, Pat Coombs and Derek Nimmo. Production stretched from 1972 through to 1977 when the film was complete, however with changes in the band’s line-up and music scene, the project was held in the MPL archives. For tickets and information www.BruceMcMouse.com. Paul McCartney and Wings, Red Rose Speedway, a six-disc (3CD, 2DVD + 1Blu-ray) numbered limited deluxe edition of the second Wings album was released December 7. Originally released in April 1973 and featuring the #1 single “My Love”, Red Rose Speedway was the first Wings album to hit #1 on the U.S. chart. The Red Rose Speedway limited deluxe edition features three discs of audio including the original album remastered at Abbey Road, no less than 35 bonus audio tracks, including a reconstruction of the originally conceived double album version of Red Rose Speedway, singles, B-sides, alternate mixes and previously unreleased tracks. The 2DVD + Blu-ray portions of the deluxe are packed with rare and previously unseen footage including the James Paul McCartney TV Special, interviews and music videos, as well as the never before seen film, The Bruce McMouse Show—fully restored and remixed in stereo and 5.1 surround sound. The package includes a folio containing 14 replica hand drawn original character sketches by Paul and facsimile dialogue sheets for the film, a 128-page book containing many previously unpublished images by Linda McCartney, expanded album and single artwork from the archives and story behind the album — including new interviews with Paul McCartney and key album personnel, track-by-track information written by Amanda Petrusich, five replica handwritten lyric sheets and photo print, and a 64-page Wings In Morocco photo book, all housed in a numbered outer slipcase. The Red Rose Speedway download redemption card will provide access to all audio in HD 24/96kHz unlimited high-resolution versions. Over the course of more than 15 years, Abramorama has successfully distributed and marketed hundreds of films, including Ron Howard’s Grammy Award®-winning The Beatles: Eight Days A Week – The Touring Years; David Leland’s Concert for George; Danny Clinch and Pearl Jam’s Let's Play Two; Paul Dugdale and Myles Desenberg’s Above & Beyond Acoustic - Giving Up The Day Job; Amir Bar-Lev's Long Strange Trip – The Untold Story of the Grateful Dead; Corbett Redford and Green Day’s Turn It Around: The Story of East Bay Punk, John Scheinfeld’s Chasing Trane – The John Coltrane Documentary; Sam Pollard’s Two Trains Runnin’; Brett Bern's BANG! The Bert Berns Story; Brett Morgen and National Geographic’s seminal Jane; Charles Ferguson’s Time To Choose; Asif Kapadia’s Senna; Neil Young’s Greendale; Cameron Crowe’s Pearl Jam Twenty; Sacha Gervasi’s Anvil! The Story of Anvil; Banksy’s Academy Award® nominated Exit Through the Gift Shop; the surprise indie hit Awake: The Life of Yogananda; Laurie Anderson’s astonishing New York Times critics’ pick, Heart of a Dog, Showtime’s National Board of Review Winner Listen to Me Marlon and Draft House Releasing’s 2016 Documentary Academy Award®-nominee and IDA Best Documentary Winner The Look of Silence. Abramorama is a founding partner of The Seventh Art Stand program, an act of cinematic solidarity against Islamophobia, that ran in more than 50 theaters across the United States in May of 2017. Abramorama recently launched its music centric film fund focused on the global release of iconic music documentaries. For more information visit www.abramorama.com.